This ID card printer is manufactured by Magicard and is known as the Magicard Pronto, produce colourful and professional ID cards. 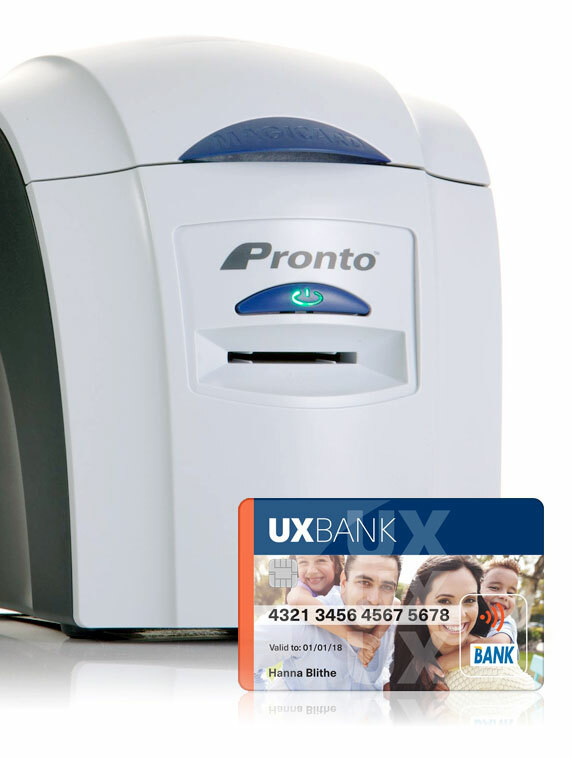 The Magicard Pronto printer delivers low cost printing and free card visual security as standard with four HoloKote watermark designs. Security can be further enhanced with encoding. The Magicard Pronto printer features a single card feed that enables you to produce a personalised card on demand in moments. Edge-to-edge and sharp image quality for simple and easy card printing. Using special rewrite cards, the Pronto colour ID card printer can print and erase the same card over and over in monochrome blue or black, ideal for visitor passes and temporary badges. A hand-fed Id card printer for on-demand applications. The Pronto offers high quality dye-sublimation printing at a great price. Incredibly easy to use with drop-in dye film and hand-fed card loading. 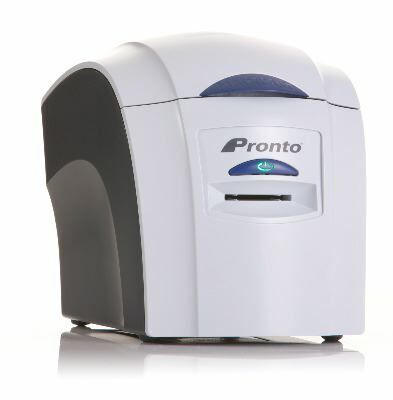 The Pronto incorporates all the latest technologies, from the ISO magnetic stripe encoding option to Magicard’s renowned patented visual security feature, the HoloKote anti-counterfeiting watermark available in 4 standard designs. Magicard Pronto printer with built-in magnetic-stripe card encoder. Prints full colour and monochrome images on PVC credit card sized cards. Holokote Security included Free on all Enduro variants – Your choice of four watermark designs, prints directly over the colour image, visible when the card is tilted for security verification. Consumables, ordered separately: Colour dye film, prints 300 full colour single side cards and comes with a free cleaning roller. Cleaning Kits include 5 cleaning cards and 1 cleaning pen. Or 5 cleaning rollers and 1 metal bar. features a single card feed that enables you to produce a personalised card on demand in moments. Edge-to-edge and sharp image quality for simple and easy card printing in a compact and highly reliable package. The Magicard Pronto printer’s aesthetic curves showcase an ultra-robust product. Its light and compact design makes it easy to transport to any location and reside on any counter or desktop. Great printer for small runs. very helpful staff, great service and aftercare. Great little printer, easy to use and give out staff id cards there and then. Great little printer, I wasn't expecting the single feed but this printer works great for re-writable cards.